When not in use, place your discs in their individual cases and store them in a cool place away from the sun, heat, and dust. 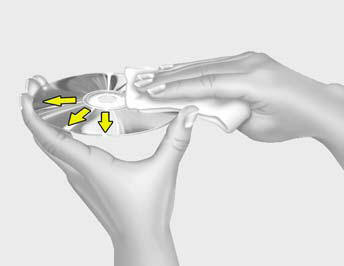 Do not grip or pull out the disc with your hand while the disc is being pulled into the unit by the self loading mechanism. Fingerprints, dust, or soil on the surface of a disc could cause the pickup to skip signal tracks. Wipe the surface clean with a clean soft cloth. If the surface is heavily soiled, dampen a clean soft cloth in a solution of mild neutral detergent to wipe it clean.